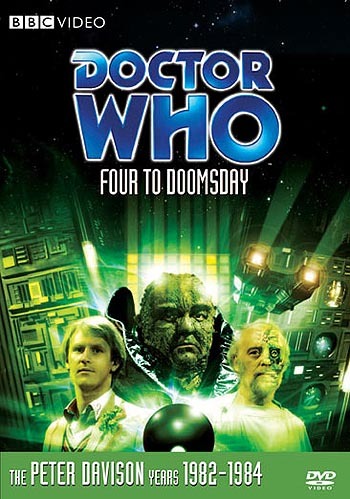 The Fifth Doctor (Peter Davison) discovers that his attempt to return Tegan (Janet Fielding) to Heathrow Airport has brought the Tardis to a spacecraft that appears abandoned at first, but actually carries a force of frog-like aliens that may challenge the future of humankind on Earth. Also featuring Nyssa (Sarah Sutton) and Adric (Matthew Waterhouse). Commentary with actors Peter Davison, Matthew Waterhouse, Janet Fielding and Sarah Sutton and director John Black. Studio Recording (dur. 27' 11") - Peter Davison's first day in the studio as the Doctor is documented in this unique studio recording recovered from the personal archive of the producer, the late John Nathan-Turner. Saturday Night at the Mill (dur. 14' 25") - Peter Davison's appearance on the Saturday night magazine programme on Boxing Day, 1980. Interviewed by Bob Langley, with a brief appearance by Davison's then-wife Sandra Dickinson. Theme Music Video (dur. 3' 34") - a brand new remix of Peter Howell's version of the theme music for the series, exclusively remixed from the original multitrack master. Option to listen to the music in either stereo (default) or Dolby Digital 5.1 surround versions. This feature made a previous appearance on 'Castrovalva' in the 'New Beginnings Boxset', but the 5.1 mix was inadvertently omitted. Photo Gallery (dur. 6' 37") - production, design and publicity photos from the story. Coming Soon trailer, Radio Times Billings PDF, Programme subtitles and Subtitle Production Notes.